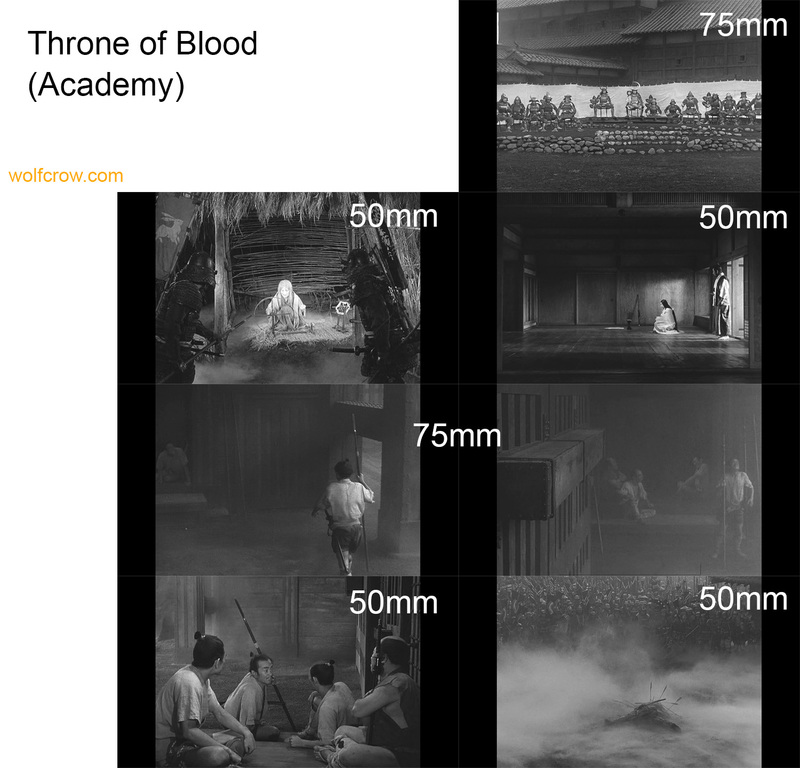 Seriously, what focal lengths did Akira Kurosawa really prefer? Akira Kurosawa is my favorite director. There’s a lot of missing information on the cinematography of his films, and lots of unsubstantiated hearsay. Most books or google searches has someone quoting he used ‘telephoto’ lenses. It was obvious the writers never bothered to probe further, possibly due to ignorance of cinematographic techniques, lenses and so on. I searched for years but couldn’t find any definitive information on the subject. I would have loved to add more, but it took too much time, and I already had the information I needed with this bunch. After shooting for so many years I don’t really need to check every frame. You sort of develop an eye for it. Find the family of focal lengths he used (not find the exact numbers – that I didn’t care about). Find the T-stops he typically worked with. 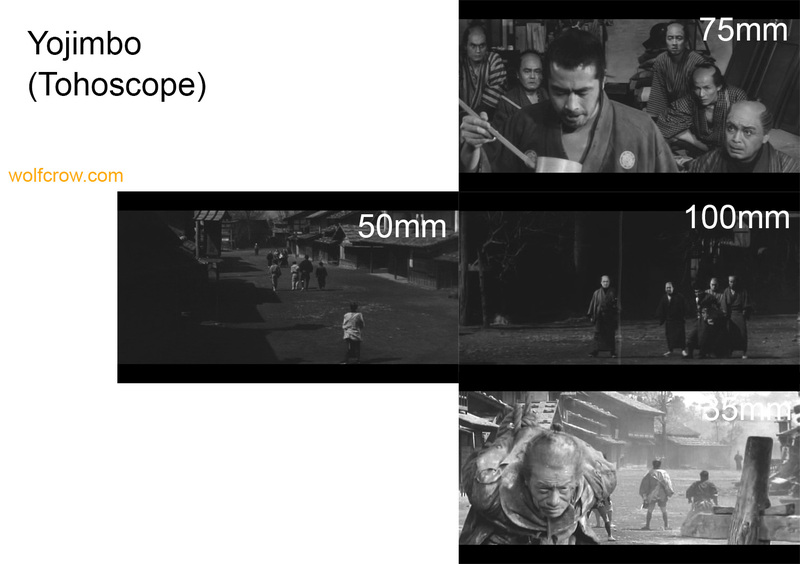 Kurosawa used multiple formats in his career, from Academy to Super35 (1.85:1) to anamorphic (Tohoscope). Every time the format changes, the lens choices will change – to the get the same ‘look’. Important: I will be presenting the focal length assuming a sensor with an 18mm vertical height. Tip: You will need to use a crop factor to arrive at the focal length for your camera sensor. To find the equivalent focal length corresponding to the sensor you’re interested in, divide the vertical height by 18, and multiply with the focal length I’ve presented. Read more about crop factors here. Important: My process is not scientific or academic. These are just simple tests I did for my personal benefit and I’m sharing as-is. Do not use it in any study or material claiming educational value. It has no educational or historic value, or informational value. 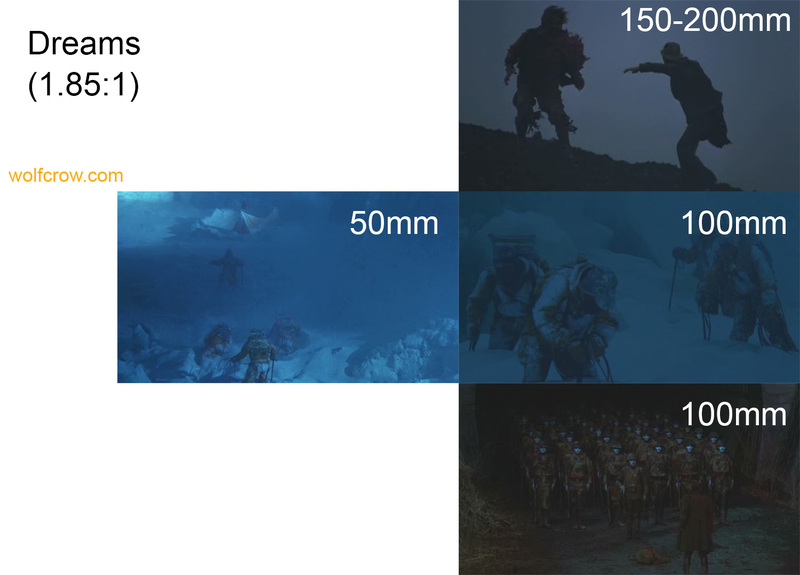 Focal lengths were derived based on a sensor the height of which is 18mm. The formats Kurosawa predominantly shot in were Academy (1.375:1), Tohoscope (Anamorphic, 2.39:1) and 1.85:1 (which I just refer to as Super 35 for brevity). Don’t let the absolute numbers fool you! The key takeaway is that Kurosawa used wide to mid range lenses early in his career with Academy, possibly because of the limited number of lenses available at the time. Then he moved on to anamorphic where he must have grappled with the idea of carrying forward his compositional style from a spherical Academy format to the stretched anamorphic Tohoscope format. You can see he did admirably well. By the way, for the actual focal lengths in Tohoscope, you might want to divide by 2. Later, when he adopted 1.85:1, he went “more telephoto”, and used Panavision lenses for his last movies. He took what he could get, and created masterpieces nonetheless. There’s a message there, you know. 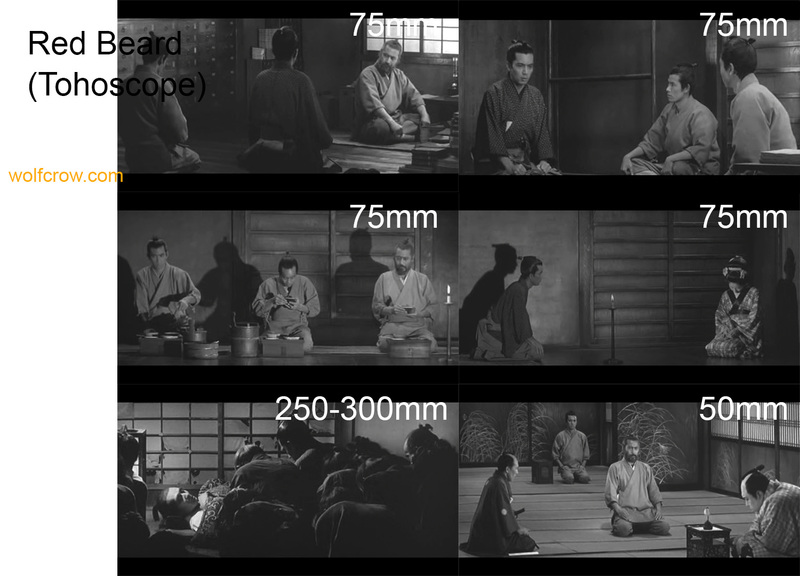 So, did Kurosawa really “use telephoto lenses”? 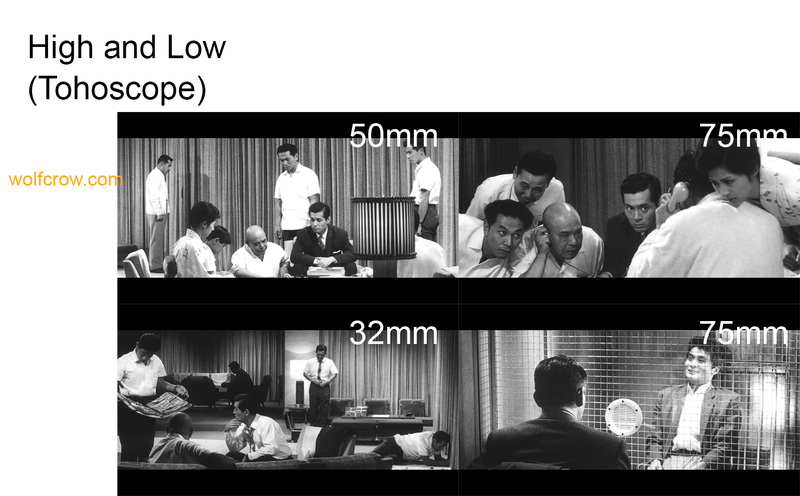 Kurosawa tended to use longer focal lengths over wider lenses. But he never shied away from using wide lenses whenever it fit in with this compositional vision. The bottom line is he used mid-range lenses for most of his brilliant work, not telephoto. What do you think? Did you find this study useful? Let me know in the comments section below. You did a very good job about one of the most influential filmmakers of all time, a true artist. I’ve learned a lot from him….Bravo!!! I think you have proved the opposite. Overall and certainly when he had control (later in his career) he mostly went long. Anything over 35 is long (US) and Europeans over 42mm but 50 and over definitely. Not as nutty long as Angelopoulos but definitely not a normal lens or wide specialist. What I like (overall – as you point out he evolved) is having flattened depth he then used composition and particularly shadows in a very painterly way. None of that hollywood – chuck in lights till there are no harsh shadows BS. Though he wasn’t above using diffusion (mostly smoke I think). I’ve got a dozen odd books on K one I remember went largely about cine and several have interviews including regarding cine. I have to clean out a lot of paper books this year so will try and review them before tossing. If I remember I’ll shout back then what I find.